The following is a list of my favorite WordPress Plugins. WordPress is a good website platform, but it becomes a great website platform when you add plugins to extend WordPress. For example, WordPress does not have a built-in backup system, but there are many great backup plugins. And WordPress does not have a built-in caching system to dramatically speed up your website. But there are several great caching plugins. That’s the great thing about plugins: out of the box, WordPress is lean and mean, just the basics. The WordPress plugin system allows you to add exactly what you need. The following is a list of must-have plugins I use on every WordPress installation. Every one of them is free. A lot of people think all WordPress plugins should be free. After all, WordPress is free. It is very cool that many WordPress plugin developers give away very powerful WordPress plugins. A big THANK YOU to all those developers. If I use a free plugin a lot, I donate money to the developer. And if I need a paid plugin, I gladly pay for it. Why? Because the time it would take me to develop and maintain a plugin is way more than the cost of the plugin. This wonderful plugin does exactly what it says: it backs up your WordPress website. And, it’s very easy to use. The following is a list of backup plugin’s options. Create Different Backup Schedules – You can create as many backup schedules as you need. For example, you can create a backup that backs up only the database and runs once a day. Or, you can create a file backup that backs up only certain files or folder. Or, you can create a backup that backups up all files and the database. Email Notification: Send an email notification after the backup runs. Manually Run the Backup – Even if the backup is on a schedule, you can run it manually any time. BACKUPWORDPRESS saves the backups on your web server in the wp-content folder. If you want to store your backups off site, you can buy one of their paid plugins to backup to services such as Amazon, Dropbox, or Google, to name a few. I have used the Dropbox plugin, and like the BACKUPWORDPRESS plugin, it’s very easy to setup and use, and it works perfectly. For custom HTML widgets, that is, widgets where you want to enter your own HTML text, images, or links, WordPress has a basic Text widget. But you have to write HTML code and manually create links and image links. The Text widget is difficult to use if you don’t know HTML code. That’s why I ALWAYS install BLACK STUDIO TINYMCE WIDGET. It’s a custom HTML widget that uses the same WYSIWYG editor that you use to edit posts or pages. If you need a simple contact form, you can find many plugins, including Jetpack, that do just that. But if you need more complex forms, with many custom fields, CONTACT FORM 7 does this well and it’s free. It’s a bit more tricky to use than the simple contact form plugins, but the documentation on the CONTACT FORM 7 website is excellent and thorough. If you need spam protection in your CONTACT FORM 7 forms, install Really Simple CAPTCHA. I also recommend installing Contact Form DB for one reason: due to spam blockers on email services like Yahoo, Gmail, or Apple, you might miss some or all of your form submissions. Contact Form DB saves every form submission in the WordPress database. If you miss one or many form submissions, you can find them in Contact Form DB. In addition, you can download a .csv file containing all form submissions and open it in a spreadsheet program. This plugin allows you to specify the pages or posts on which a widget appears. With Display Widgets, you can specify on which pages, posts, categories, custom post types, or tag pages the widget displays. If you want the widget to show on most pages, but hide it on a few pages, you select Hide on Checked Pages. If you want the widget to show only on a few pages pages, you select Show on Checked Pages. If you want the widget to show on all pages, don’t check any pages. 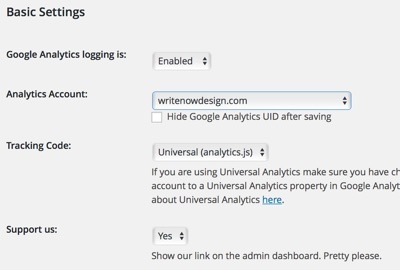 The GOOGLE ANALYTICATOR plugin allows you to display basic Google Analytics stats in the WordPress dashboard. You might be thinking: why should I install a plugin to view Google Analytics when I can log into Google Analytics to see them. I thought the same thing myself until I tried it. 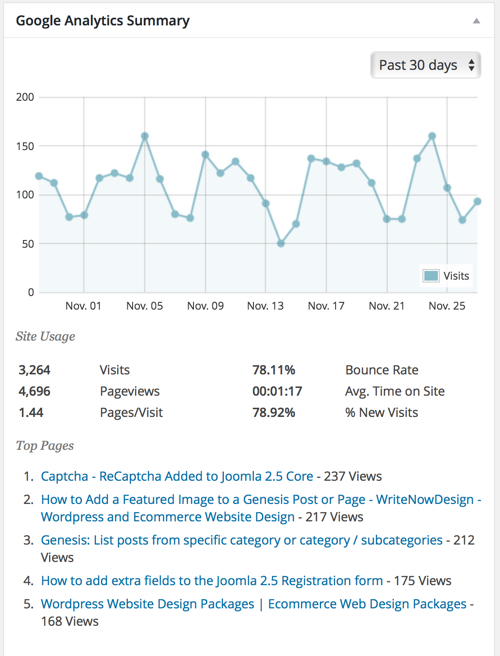 It’s very nice to get a quick look at my Google Analytics stats when I log into WordPress. This plugin is pretty easy to set up. Make sure you are already logged into Google Analytics when you connect the plugin to Google Analytics. The reason you need to be logged in is because the plugin needs permission from your Google Analytics account before it can display your site stats. If you have more than one website on your Google Analytics account, make sure you select the right site from the Analytics Account list. This simple plugin allows you to specify a maximum width and height for uploaded images. Why do you need this? Many people upload images right out of their cameras without modifying the image size. Even phone images are much bigger than you need on a website. As a result, people upload and insert gigantic images in their pages. And this practice slows down your page loading to a crawl and takes up an enormous amount of disk space on your web server. The settings on IMSANITY allow you to specify a maximum height and width. If you don’t know what that should be, accept the defaults. Jetpack is a plugin FULL of plugins, literally. I don’t use them all, but below is a list of the ones I use. I’m sure you will find many more that you can use. This plugin creates a beautiful popup slideshow of any WordPress galleries that are embedded in a post or page. With Enhanced Distribution, Jetpack automatically shares your posts and pages with search engines and services that aggregate content. That means your content is more likely to be found in search engines. This is a great plugin if you have multiple websites. After you activate the Manage plugin in all your websites, you can manage them using the your dashboard at WordPress.com. Even if your sites are not hosted at WordPress.com, you can use this plugin to manage all your sites. If you have Site Stats activated, the dashboard shows the stats for all your sites. Also, it shows you all the plugins installed on your sites and allows you to update all plugins on all sites with the click of a button. The Monitor plugin monitors your website for uptime. Every five minutes it checks the availability of your site. If Monitor cannot access your site, it sends you and email notification stating that your site is down. It continues to check your site and once it is back up, Monitor notifies that your site is up. It is worth installing Jetpack just for this plugin. This plugin prevents Brute Force attacks. Also, if someone repeatedly attempts to log into your site and fails, Protect will block them from accessing your site. Also, Protect has an added advantage. Because it is part of WordPress.com, it has access to ALL WordPress.com sites and all sites using Jetpack Protect. As a result, if Protect finds an IP address that has repeated failed login attempts on any WordPress.com or Jetpack-protect site, it blocks that IP address from ALL sites that use the Manage plugin. With the Site Stats plugin activated, WordPress.com collects website traffic data on your site and displays it in an easy-to-understand dashboard. I like to use Site Stats in conjunction with Google Analyticator to provide a cross reference on my site statistics. If you have embedded galleries in a post or page, you can specify tiled galleries to create a beautiful layout of your gallery images. What can I say. It’s simple and it’s clean. 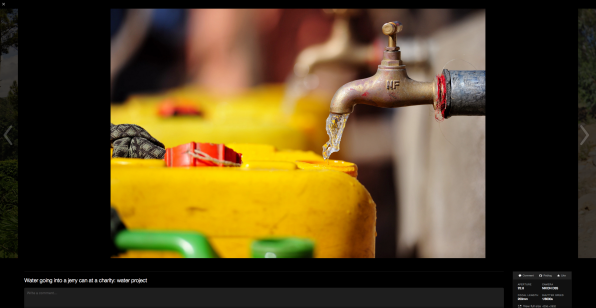 Simple Social Icons is a widget that adds social icons to your site. It has the standard social media links like Facebook, Google +, LinkedIn, etc. And you can change the design colors. One thing to note: this is a flat design: the logos are solid colors and they are all the same colors. If you want the original social icons, you’ll need to use a different plugin. That said, I encourage to give this a try. The logos are fonts so they are very sharp on any screen and in any size. Also, you can change the background and font color, the logo size, and border radius so you can make them round if you want. WP Super Cache makes your site a LOT faster by caching all your websites pages. Unless you already have a caching tool installed, use WP Super Cache to speed up your site. It’s very easy to set up. In fact, you can use the default settings and your site will be instantly faster. The Yoast SEO plugin has become the standard WordPress SEO plugin. There are several other good ones out there, but Yoast SEO has the most installations. And for good reason: it’s easy to use, and it helps you optimize each page by making sure you have all the correct SEO settings and data on each page or post.